American chestnut can also be found outside of its original range. One example of this is the presence of several chestnut trees distributed throughout Nova Scotia. 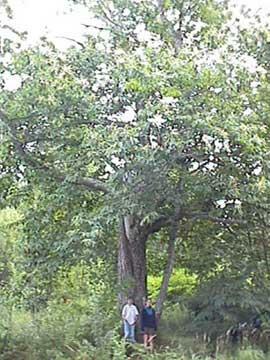 The presence of these trees is often associated with the migration of the United Empire Loyalists following the War of Independence in the USA, when people familiar with the American chestnut in the northeastern USA migrated to Nova Scotia and brought seeds of American chestnut with them. More recently, there is a renewed interest in this species, and individuals are initiating new plantings of American chestnut. The presence of American chestnut outside of the original distribution of this species is very important for the long-term survival of American chestnut because these trees are also outside the range of Chestnut blight, the primary cause of the decline of this species. The presence of these populations represents a "safe haven" or "refuge" for American chestnut where they can continue to survive in the absence of Chestnut blight. Mr. Les Corkum, from Falmouth, Nova Scotia , wrote an excellent summary of the current status of American chestnut in Nova Scotia in 1998. This article can be accessed by clicking here. the largest surviving trees in North America.